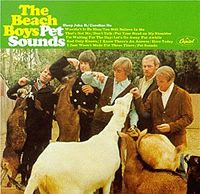 There's nothing new to be said about an album like Pet Sounds. It's one of the most influential records in rock history, and it's every bit as good as everyone says it is. I just wish, for the life of me, that I could remember where I got my copy. The LP I have is the slightly rarer mono version, with a hole punched in the top right corner, and the initials "TL" written in pencil on the top white border. Those initials don't mean a thing to me. One possibility: There was a glorious moment in our childhood, when my brother and I each ended up with small stacks of some pretty important classic rock records, given to us by a neighbor who was having an unsuccessful garage sale. That would be my best guess as to where I picked this up. Because I know I didn't shell out a bunch of money for it, and it's not in great shape, so it would make sense that I acquired it in my far less discerning teen years. I won't dissect the songs here, because it's been done to death. But if you don't recognize "God Only Knows" as a great, great, song, then I'm not sure I can talk to you. Somewhat interesting side note on this record: In 1993, Frank Black released his first post-Pixies solo album. It contained "Hang On To Your Ego," which was a cover of "I Know There's An Answer" from Pet Sounds, with a different chorus. For a long time, I assumed that FB had changed the lyrics himself, until the Pet Sounds box set was released, and I saw "Hang On To Your Ego" listed in the outtakes. Pretty sweet move, covering the original, non-album version. This is one of those albums, as I briefly discussed in an earlier post, that self-respecting fans of music feel they should own. You know, I own this based on the oft-quoted McCartney claim that it is his favorite record. And while I really enjoy it, for some reason it doesn't move me as I feel it should. I feel myself LOVING one song and then tuning out the next, over and over again. I don't know if it is the sequence of the album or what, but Wilson seems to have alternated between genius song and noodling filler. Just my take. "God Only Knows" is the tops, with "Wouldn't It Be Nice" and "Caroline No" coming in a close second.